Sonatine : for flute and piano / Mark Isaacs. Contents note: I. Allegro vivace -- II. Largo supplicando -- III. Allegretto con spirito. Commission note: Commissioned by Melissa Doecke with funds provided by Australia Council. Music Board. 13 Mar 2016: at The Enchanted Flute - Melissa Doecke & Mark Isaacs (Customs House (Brisbane)). Featuring Mark Isaacs, Melissa Doecke. 10 Mar 2016: at The Enchanted Flute (Ian Hanger Recital Hall). Featuring Mark Isaacs, Melissa Doecke. 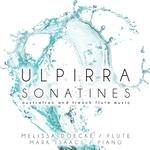 9 Mar 2016: at Ulpirra Sonatines - Australian & French flute music (Melbourne Recital Centre, Primrose Potter Salon). Featuring Melissa Doecke, Mark Isaacs. 5 Mar 2016: at The Enchanted Flute (Theme and Variations (Willoughby)). Featuring Mark Isaacs, Melissa Doecke. 8 Feb 2014: at Melissa Doecke & Mark Isaacs - recital (The Flute Tree). Featuring Melissa Doecke, Mark Isaacs. 3 Nov 2012: at Aldo Baerten (Theme and Variations (Willoughby)). Featuring Aldo Baerten, Gabriella Pusner. 10 Aug 10: Clancy Auditorium, University of New South Wales, Sydney. Featuring Australia Ensemble, Ian Munro, Geoffrey Collins. 6 May 2010: at Free Lunchtime Concert (Nickson Room). Featuring Melissa Doecke, Mitchell Leigh. 5 Oct 2009: at Melissa Doecke & Mark Isaacs (Elder Hall). Featuring Melissa Doecke, Mark Isaacs.